Ackk! 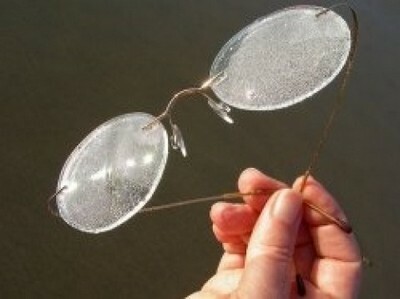 My glasses are smeared again! I reach for my specially-treated, purple cloth and wipe off the yuck. How does that stuff get there? Always amazes me that it just appears. Usually, I don’t notice that my glasses are dirty, and I don’t realize I’m squinting. Sometimes, I get a headache. The change is so subtle that it’s overlooked. After removing the film and spots from my glasses, my eyes relax and I can see better. Aren’t we like this spiritually? I know I am. Looking through spiritual lenses, I don’t realize the build up of smudges, spots, and blemishes caused by the things I say, do, see, hear, etc. Things get blurry. And get worse. It’s like gradually drawing down a blackout shade. So imperceptible that it isn’t detected. Until it is pitch black and I don’t know where I am! I tolerate those tiny, subtle spots and unconsciously overlook them. I end up with a squinting spirit and instead of a headache, I develop a heartache. And the disconnect from the Lord slowly takes place. Have you been seeing clearly lately? If not, clean your spiritual lenses and you’ll know where you are! ***Dug this out of the closet. Hope you don’t mind a rerun. This is so good. thank you for speaking truth into our lives. i don’t want to “tolerate” the smallest spot. When you are cleaning your own glasses make sure you use the right cloth. The cloth soaked in the fountain of Jesus blood, not the filthy cloth of our own “righteousness” and works! Ackk! My glasses are dirty again! Hi Lynn, I have those same problems with spots and streaks on my glasses too, and hope my soul is streak free. Jesus will wash us all clean when we ask him to, and it is good to examine our selves and see what needs tending to. Wonderful post, Lynn. I think of the myriad things the Jewish people had to perform to find even a measure of forgiveness for their sins, and I compare that to our forgiveness through our precious Christ, it’s overwhelming. Thanks for reminding all of us. Oh Lynn, what an amazing analogy! I love it!! Thanks so much for sharing. I liked this blog because I have currently been struggling with migraines and vertigo and keep saying I think I need to get to the eye doctor. Isn’t it amazing how we get a better picture of our Savior when we don’t have sin hindering us? Hope you’re having a wonderful Saturday…you need to stop by my blog sometime!! Love you!! Sorry I haven’t responded. My husband had a heart attack and had two more stents implanted (he already has two). Thanks so much, Terra, Pat, Jean, leainggodsgeneration, and Gigi, for taking time to read and comment. I so appreciate each one of you. Blessings to you! I am so sorry to hear about your husband. I pray for the hand of God on you both for healing and supernatural strength! I was just going to add a comment about the need for prayer, many times from others,to get ourselves cleaned off. Jesus used the analogy of foot washing. It is true that the world leaves dirt on our feet and He said if your feet are clean so is the rest. There is also the need to pray with one another to clean off the enemy deposits as we journey and battle. May the blood of Jesus wash over you both with healing, refreshing and empowerment for the days ahead. Thank God for The Holy Spirit, as I allow Him, He reminds me to check. I just trust Him that I will not over look those reminders as I sometimes do.